The leader of the Houthi rebels backs peace talks to take place next week in Geneva. The leader of the Houthi rebels in Yemen on Wednesday backed peace talks in Geneva, Switzerland, next week, hours after they were announced by the United Nations. According to The Associated Press (AP), the rebel leader Abdul-Malek al-Houthi said the talks were the "only solution" for the conflict roiling his country. He spoke just hours after the announcement from the UN that the talks would start in Geneva on May 28. Earlier, Yemen's UN Ambassador Khaled Alyemany said the government of President Abed Rabbo Mansour Hadi, now in exile in the Saudi capital of Riyadh, will also attend the talks, adding it would be represented at a high level, perhaps by the vice-president. But a top Hadi aide, speaking on condition of anonymity because he was not authorized to talk to the media, reiterated earlier government demands that the Houthis first pull out of towns and cities, including the capital, Sanaa, which they captured in a power grab that started last year. He said that the government wouldn't give up its condition for the talks, according to AP. UN chief Ban Ki-moon has urged all parties to engage "without pre-conditions," stressing the only way to resolve Yemen's conflict is an "inclusive, negotiated political settlement." Ban was expected to attend the start of the Geneva talks. The UN's new envoy to Yemen, Ismail Ould Cheikh Ahmed, held meetings with rival political players in Yemen earlier this month. At the time, the Houthis expressed readiness to resume peace talks, insisting they take place in a "neutral" country. But in his speech, broadcast on the rebels' TV channel, al-Houthi gave no indication his forces would withdraw and instead called for new recruits and for his followers to open new training camps to confront the Saudi-led air campaign. "There is only one solution. Talks should be held in a neutral country," al-Houthi was quoted by AP as having said. 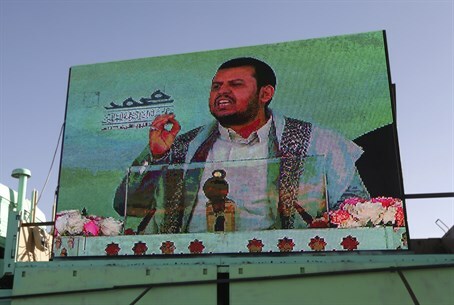 A Saudi Arabian-led alliance began launching airstrikes on the Houthi rebels on March 26, aimed at restoring exiled Hadi, who was forced to flee Yemen when the Houthis began marching on Aden. On Wednesday, both the Yemeni ambassador and the Saudi ambassador to the UN, Abdallah Al-Moualimi, ruled out Iran's participation in Geneva. "There is no place for Iran in the consultations in Geneva," Al-Moualimi told reporters, according to AP. "They have not been playing a constructive role, and as such cannot be rewarded by having a seat at the table." UN deputy spokesman Farhan Haq said the format of the Geneva talks was still being worked out. He said Ahmed is expected to visit Tehran on Thursday for meetings with officials on Yemen, but did not give details.